Unfortunately daylight is hard to come by these days. Of the (long) list of things I love about summer, the sun setting late in the evening is near the top! It's rare that I get home these days before dark which is why the lighting in these pictures is a little weird. 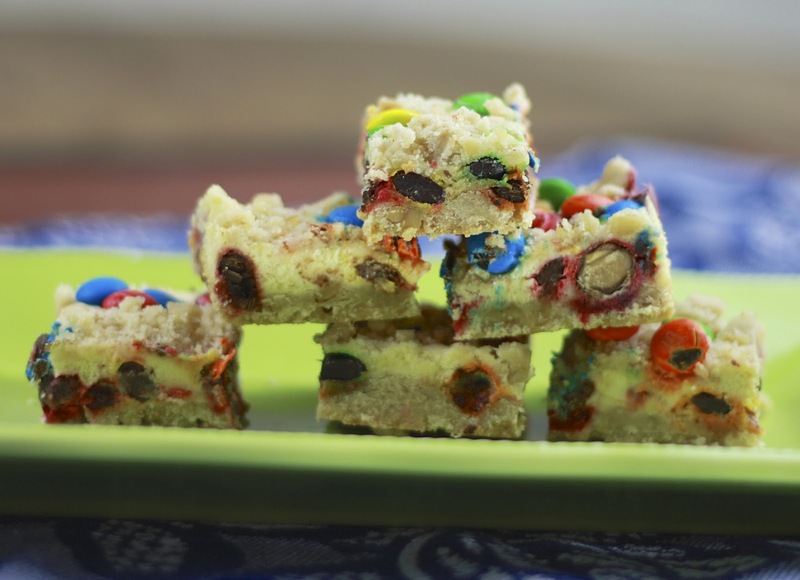 Don't let the artificial lighting confuse you--these bite-sized M&M cheesecake bars are a tasty little treat! I will always love bar cookies for their overall convenience. You mix, dump, and bake. These are a little more complicated in that you first bake the crust before adding the cheesecake layer, but even so you can whip them up in less than an hour. The nuts in the crust add a heartiness and cut some of the sweetness. The cheesecake looks like it melts between the crust and topping, but one bite and you can't miss its unmistakable richness! These were a huge hit with our community group and definitely belong in the 'make again' category of this blog! 1. Preheat the oven to 350F. Line an 8-inch square pan with foil and grease. Cream butter and brown sugar until light and fluffy. Add the pecans and flour, mixing until well-combined. 2. Set aside 1/2 cup of the crumb mixture and press the remaining into prepared pan. Bake for 10 minutes. 3. Meanwhile, combine the softened cream cheese, granulated sugar, and vanilla, beating until well-combined. Add the egg and mix. 4. Remove crust from oven and sprinkle 1/2 cup M&Ms over the crust. Spread cream cheese filling over M&Ms. 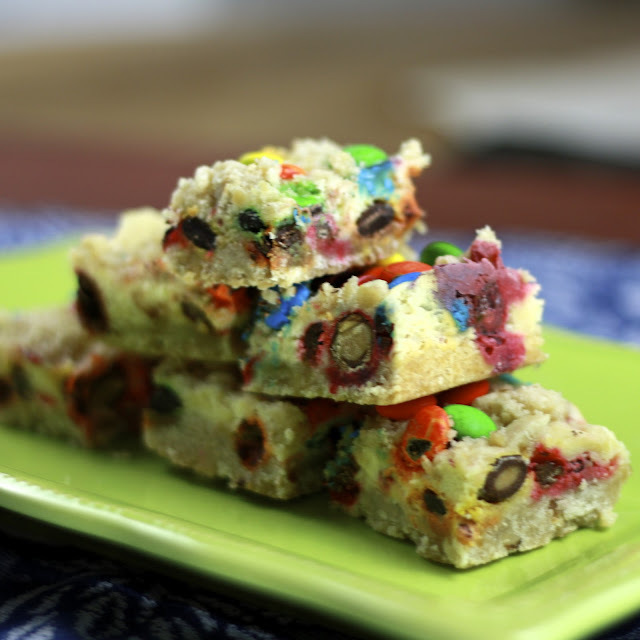 Top with remaining crumb mixture and remaining 1/2 cup M&Ms. 5. Bake for 20 minutes. Allow to cool completely before covering and refrigerating for at least 2 hours. Cut into squares and serve.